Some photographers prefer trial and error to actually reading their camera manual. If you’re one of those hands-on learners, there’s probably an online video that takes you through the buttons and gadgets of your camera. For me, it started with a few visits to area photography clubs. Sitting through competition judging and hearing presentations about specifics, such as sports, landscapes, and nature, helped me realize how little I knew about photography. I enjoyed photography, but I knew so little and now I knew I needed to know more. The major camera store in our area offered classes and photo walks, as did the camera clubs and there was so much to learn, my brain often got full. So, it was I remembered what I could from the many lessons I sat through and I still discovered mistakes in my photos. Well, maybe not ‘mistakes’ – should I say room for improvement – but the more lessons I took, the more I learned about what makes a better photograph and that helped me see the errors of my ways. We hit the photographer’s lottery when we discovered thousands of YouTube videos about every aspect of using a camera to produce an image. You want landscape. You got it. Backlighting? You got it. Portrait, lighting, sundown, sunup, night, street, invisible, you got it. Just kidding about invisible. When you find a favorite pro whose tips make sense to you, you can subscribe to their videos. While you’re waiting for new videos you can check out their past posts. I created a YouTube library of these video tips. Many pro photographers have great web sites and much to see there. They land in our bookmark folder labeled Photography Pro. Meanwhile, we’ve also subscribed to a few email lists for photographers. They can be overwhelming if you subscribe to more than two or three. We archive the hints and will someday go back to look for certain topics. 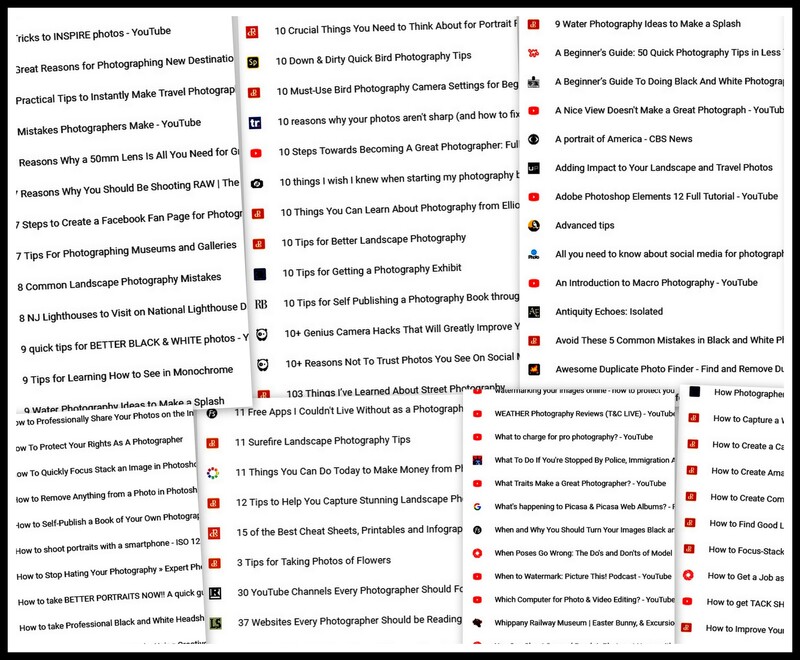 And many of the online articles land in a bookmark folder labeled Photography Tips. Not all these videos, online articles, and such will appeal to everyone. Some photographers prefer trial and error to actually reading their camera manual. If you’re one of those hands-on learners, there’s probably an online video that takes you through the buttons and gadgets of your camera. One thing I learned from entering the same photo in separate competitions rated by separate judges is that the comments, though usually accurate, from one judge may be completely different from another judge looking at the exact same photo. It boils down to that Ricky Nelson song, you’ve got to please yourself. And there’s a video for that song, too.